In addition to my In The Bag series, I wanted to start a new one to have something more regular to showcase five different items that can be applied to everyday travels – shot in the ever popular #flatlay style. For my first post of Daily Essentials, items for summertime in the city in blue tones that were selected since it is a favorite of mine and has been noted as being very popular right now (though isn’t always?). To add a summer vibe, torte and hemp also play a role in this set. The slim cross-body square tote is from Ben Minkoff ($350) and is named the Heath Zipper Tote. I fell in love with it right away for its simple, yet chic design and the sharp royal blue. It is crafted in genuine leather and has a later zip pocket and several open pockets inside. You’ll be seeing it again soon in an Outfit post! Also to be see again soon in an Outfit post, the shoes are from TOMS ($140) and the TOMS+ collection. Called Blue Medallion Classics, they are a tasseled update to the brand’s classic slip-on style and greatly embody the mood of this set. Headphones are Bang & Olufsen ($149) for Pepsi’s #LiveForNow designer collaboration. The style is their Play Form 2i Headphones Headphones, which to me greatly combine a sleek, artful band (designed by London artist Hattie Stewart) with vintage style earphones. The fragrance comes from John Varvatos ($84), the Artisan Aqua, which you can read about here from when it was released and why it is a great summer scent, and sunglasses are Warby Parker ($95 – a similar style), which were previously styled for in Labor Day outfit that makes a statement. 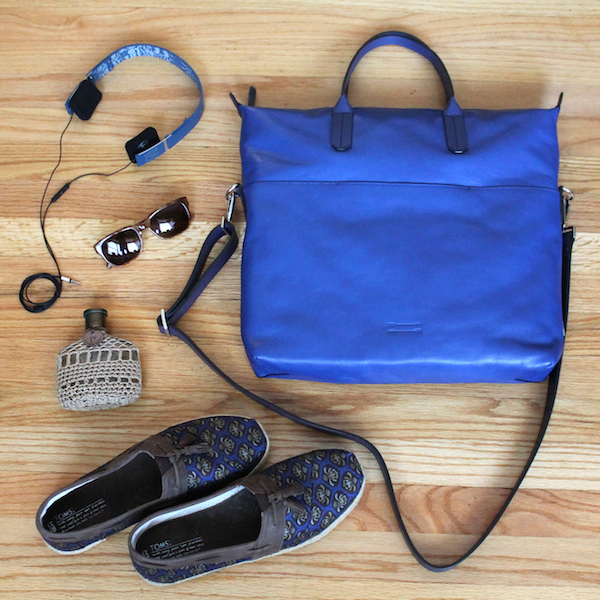 Posted on July 11, 2014, in Fashion, Grooming, Shopping, What To Pack and tagged Accessories, Bag, Bang & Olufsen, Ben Minkoff, Daily Essentials, Fashion, Fragrance, Headphones, John Varvatos, Men's Fashion, Menswear, Shoes, Style, Toms, Warby Parker. Bookmark the permalink. 2 Comments.